We can help. Our Santa Cruz personal injury law firm is successful in handling cases where motorcyclists have suffered injuries due to the negligence of others. The attorneys at SS&F have extensive experience representing motorcyclists who suffer catastrophic injuries. We know the best “expert witnesses”, including engineers, who can reconstruct the accident so the truth about how it occurred will be known. We work with experts in the field of human factors and visual perception, who can describe to a judge or jury why the motorist responsible for the accident “never saw the motorcyclist coming”. 46-year-old machinist was rendered a T-5 paraplegic when another motorist pulled out in front of him from a private driveway. When the rules of the road on our highways are violated, among the most vulnerable of potential victims of such safety rule violations are motorcyclists. Even an otherwise minor collision can result in catastrophic injuries to motorcyclist. 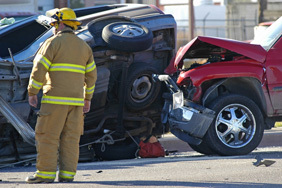 A minor “fender bender” can result in multiple fractures, spinal cord injury, brain injury or even wrongful death to an innocent motorcyclist who is riding by the rules of the road. As experienced motorcyclists who drive defensively well know, other drivers often can look right at a motorcyclist but not “see” them. The most common motorcycle accidents involve pullouts and left turns in front of the biker. Many times, the car or truck driver will simply say, “I didn’t him coming.” This is why motorcyclists who hold a valid California motorcycle license are trained and experienced in defensive driving. Running lights and a helmet are not enough. Most motorcyclists are among the most defensive drivers on the road, because their life depends on it. Don’t let the insurance companies point the blame. Let the law. The first thing the insurance industry likes to do in motorcycle cases is blame the motorcyclist. Many jurors assume that if someone is on a motorcycle, he must have been speeding or driving erratically. To overcome the bias in our community that often exists concerning motorcycle operation, effective legal representation requires focusing the judge and jury on the specific facts of the given case to prove that the responsible parties violated the rules of the road and created unnecessary danger to the injured motorcyclist. Prosecution of a serious injury or wrongful death claim involving a motorcyclist often requires the expense and use of a number of expert witnesses, including accident re-constructionists, motorcycle handling experts, bio-mechanical engineers, and human factors experts. Seek the compensation you may deserve. The attorneys at SS&F have a long history of representing motorcyclists and their families in cases like these. SS&F has obtained millions of dollars in recoveries because of its aggressive approach to obtaining all available collision scene evidence, identifying crucial witnesses, hiring the appropriate experts, and holding those who are responsible for creating unnecessary danger to our clients accountable.